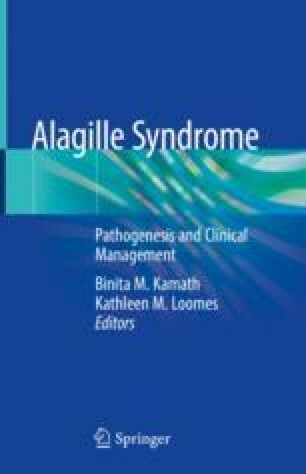 Non-cardiac vascular anomalies and events are now widely recognized in Alagille syndrome (ALGS) and are a significant cause of morbidity and mortality. Cerebrovascular disorders in ALGS includes cerebral artery aneurysms, moyamoya syndrome, and anomalies of the internal carotid artery. Systemic vascular abnormalities have also been documented. These structural anomalies contribute to but do not fully explain the high incidence of intracranial and systemic bleeding episodes in ALGS. The presence of vascular anomalies in ALGS is consistent with the intrinsic role of the Notch signaling pathway in vascular morphogenesis, angiogenesis, and vessel homeostasis. Given the relatively high prevalence of silent cerebrovascular disease in ALGS, it is becoming accepted that all patients undergo screening imaging with computed tomography scan or magnetic resonance angiography. This is particularly important in those undergoing liver transplantation or major surgery.